Elmore Leonard, grand master of sleazy characters and rapid-fire dialogue, is more than just a mind-blowing crime writer. He's an inspiration. After pioneering the western genre in the '50s, including the short story Three-Ten to Yuma and the novel Hombre, Leonard turned to a new arena with crime thrillers such as Get Shorty and Out of Sight and spurred countless movie adaptations of his books. What makes the former ad-man so distinctive? His character-driven style and lean, mean prose. Leonard talked with Goodreads about his new book, Road Dogs, and explains why writing pads must be bought in bulk and how George Clooney needs some sweet talking. Goodreads: Road Dogs brings together characters formerly introduced in three separate novels that you wrote over the past 20 years (Jack Foley from Out of Sight, Cundo Rey from LaBrava, and Dawn Navarro from Riding the Rap). What inspired you to bring these three together in one story? Elmore Leonard: I remembered that I liked them. The most recent character was Dawn Navarro, and I thought I could do a lot more with her. I knew I was going to bring back Jack Foley for George Clooney, but he's now decided that he doesn't want to play another bank robber. I'll go to him again—maybe he'll be in a different mood. The third I remember liking, Cundo Rey, didn't have much of a part (he was the third male lead). But I thought he was killed, so I picked up my book again, and sure enough, he was shot three times in the chest—but it doesn't say he was killed. So I brought him back: He was picked up by emergency guys, taken to the hospital, and was in a coma for 30 days. He comes back and makes a lot of money. GR: The latter half of your career has consisted of crime fiction like Road Dogs. Do you think you'll ever go back to writing westerns? EL: I think it is possible, but it is just not that popular now. But I might have a lot of fun writing it, so that would be worth it. GR: So what are you working on now? EL: I'm working on a book that I'm going to call Djibouti, which is a city at the southern point of the Red Sea before you go around the east coast of Africa into the Indian Ocean where all the pirating is going on. I started researching this in November when there were very few pirates. It has been in the headlines in the past two weeks, because they tried to hijack their first American ship and failed. For my story, I thought of a documentary filmmaker, a young woman named Dara Barr, who has already made three films—all award winners, with one about the hurricane in New Orleans. She wants to make a documentary about the pirates because she sympathizes with them. There's no government in Somalia. Their fishing grounds had been spoiled and overrun. They can't make a living, so they took up piracy. It looks so easy because none of the ships are armed. GR: It sounds like a western, but on water. EL: [laughs] Yes, it does! It opens in Djibouti, where Dara is picked up by her assistant, a 6-foot-6 black man who has been around the world many times as a merchant seaman. He knows these waters. They lease a boat and go out. Forty days later they're back, and she's in her studio looking at footage. Things begin to happen to her once she's home, because she's stuck her nose into some things and now she's in jeopardy. She wants to name her documentary Djibouti because she likes the sound of it, and I'm calling the book Djibouti for the same reason. I don't know if there will be another scene there or not! I have no idea how it ends, but I've got to get this book out, or else too much time will expire. GR: You have mentioned how your characters drive the action forward, rather than the action driving the characters. Do you throw out a lot of rough drafts and do a lot of rewriting? EL: I don't have a computer. I order about 50 unlined yellow pads at a time from a print shop, because this was the kind of yellow pad we had at the ad agency where I worked in the '50s. I like them, because you don't have to be orderly about the writing without the lines. Some of my longhand is barely decipherable, because I'm just writing fast as I think about it, as the characters talk back and forth. I'll probably throw away four sheets to get one. That seems to work for me. The rewriting is done as I'm writing. Once I get through a scene, and I don't know what will come next, I type it and try to clean up the presentation. I always hope for about four or five pages by the end of the day. The next day I rewrite it, pick at it, and add things, because it is too spare the first time I write it. I add in cigarettes, or a drink, or something going on. I think writing is rewriting. GR: How much do you focus on plot structure? EL: I make the whole thing up as I go along. The characters are presented in a situation in the first 100 pages, and then a turn will come. Something's going to happen. Then I have to think about the second act. The characters can tell me what they are going to do. It is all realistic: This is what she would think if she's undercover, how she would react. Once I know the people, I know what they're going to do, but they surprise me, too. GR: Your first short story was published in 1951, and your career has spanned almost 60 years. Do you ever go back and read your early work? EL: I do, almost every day, but just a little, just to get started. I sit down at the desk, pick up an older book, open it anywhere, and sometimes I'll laugh—but I didn't laugh when I wrote the line. I think, "I wrote that?" Of course I did, but I don't remember it. GR: How has your style changed over the years? EL: My 30 westerns were all produced in one book. When I read those, I would definitely say my style has changed. I think it started with one of the last westerns—I was trying to get a little more humor in it, but also to be more spare in the writing. I was using pronouns and making a lot of noise with the writing. GR: You also recently published 10 Rules of Writing. You sum up the rules with, "If it sounds like writing, I rewrite it." In transitioning out of westerns into crime, is this the point in your career when you began to master this concept? EL: Yes, a lot of the westerns sounded like writing. It is that sentence: "Upon entering the room, he observed...." It sounds like writing. I don't do that anymore—I'll figure out another way for him to enter the room. Another rule is "leave out the parts that readers skip." You know when you're writing it, because it is something that you feel deeply about, something that you get serious about, and it doesn't work. EL: In the early '50s, when I had a job, I would get up at 5 a.m., write for two hours, and then go to work at an ad agency. I did that for most of ten years—I was writing westerns then. I sold five westerns and 30 or so short stories (and a couple of those were turned into movies), so it was worth getting up that early. After I left the ad agency, I was writing at home, and I would usually get going by 9 a.m., and I would work until 6 p.m. Always. I would skip lunch—maybe have some peanuts. But in the last year or two, I'm getting to work later. I'm finding more distractions, maybe because I don't have a very strong urge to sit down and start writing. But still, once I get going, I'm where I want to be. GR: What authors have influenced your writing style? EL: My biggest influence at the very beginning was Hemingway. I grew up reading Hemingway—I loved him. When I was writing westerns, I would open For Whom the Bell Tolls anywhere, because they are in the mountains with horses and guns. I got in the mood. But then I realized that Hemingway didn't have a sense of humor, at least not one that he demonstrated, and I had some funny things to say. Then I found Richard Bissell, who wrote five or six books in the '50s. He was a pilot who steered river boats on the Mississippi River, and then he started to write. His books were all very straight and lean, but they're funny. And he doesn't seem to try to be funny, which is the best humor. He influenced me quite a bit. EL: I don't read as much anymore. I like Cormac McCarthy, George Pelecanos, Dennis Lehane, Russell Banks, and Annie Proulx. I'm reading her new book now. Quite a good little interview, actually. I'd love to hear more about Richard Bissell - he only has 5 ratings on Goodreads! i love his advice, which he has said before: if it sounds like writing, take it out. It's great to hear that another writer isn't totally snared in the tech-tattered world we live in today. How wonderful to see Elmore Leonard at Good Reads. For my money, he's the finest author currently writing - I think I've read every one of his published works and I never fail to be blown away by his quirky characters and his wonderful ear for dialogue. He was certainly a big influence on my writing, particularly the thrillers I wrote for Headline through the 90's and he's so right about letting the characters give you the story. Long may he continue to entertain us! 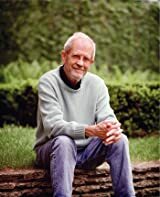 I love Elmore Leonard's books and agree with Philip that EL's the best. I have read all his books and re-read several. He's my favorite because of the dialogue and humor. This great interview explains how he does it. Thank you GoodReads! Elmore always praises Hemingway, and many see Hemingway as among the greatest writers in history. But pick from among dozens of sentences, paragraphs, pages, even chapters from Leonard and ask this: Why isn't Leonard equally revered? In fact, why isn't he seen to have surpassed Hemingway, having mastered writing as tight and powerful as it gets, and with the humor Hemingway lacks? There's no humor in this passage, but look at the first paragraph of Pagan Babies and ask if Hemingway ever wrote anything better or more powerful. Joe, I think the answer is simple enough. Elmore Leonard is still alive and Hemingway's reputation has advanced since his death. It's hard for any writer to achieve greatness in his or her own lifetime and perhaps, when he has gone, Leonard's achievements as a writer will finally be fully appreciated. That's a Catch-22 I don't like very much, although you may have a point. I suspect, though, that it has more to do with a lingering sense of insubstantiality respecting Leonard's genre, crime fiction, a holdover from the days before Chandler when stories about crimes, cops, and criminals were found almost exclusively in pulp magazines, adorned with lurid images, and looked down on, to put it mildly, by the Fitzgerald/Hemingway/"serious literature" aficionados. Anyway, I offer this Elmore excerpt in further support of my view that no one, in any genre, writes better that Leonard. He does it so simply you actually think, Hey, how hard can it be? Give it a try and see. It's no harder than being Tiger Woods. And in the meantime, show me a non-Leonard book that grabs the reader like this does, compels him to keep reading, even as the reader is transformed, becoming unaware, almost immediately, that he's reading a book and is not, in fact, a fly on the wall in this scene and those which follow. << Every time they got a call from the leper hospital to pick up a body Jack Delaney would feel himself coming down with the flu or something. Leo Mullen, his boss, was finally calling it to Jack's attenion. "You notice that? They phone, usually, it's one of the sisters, and a while later you get kind of a moan in vour voice. 'Oh, man, I don't know what's the matter with me. I feel kind of punk." Jack said, "Punk, I never used the word punk in my life. When was the last time? I mean they called. Wait a minute. How many times since I been here have they called, twice? Leo Mullen looked up from the body on the prep table. "You want me to tell you exactly? This is the fourth time I've asked you in the past almost three years now." Leo wore latex gloves and a plastic-coated disposable apron over his vest, shirt, and tie. He looked like a man all dressed up doing the dishes. I agree that crime writers generally get a bad deal when it comes around to handing out the respect - and yet, this is the genre where most of the best contemporary writing goes on. I don't want to diss Hemingway too much though - For Whom The Bell Tolls is a great novel. Then again, Elmore has written thirty plus great novels. And here's the kicker. How does a seventy odd year old guy manage to be so cool? Elmore Leonard is the hippest guy in America, and has been for a long, long time. How else do you write something like this, from Up In Honey's Room (the book he wanted to call Hitler's Birthday) at the age of 81? “Anytime Walter wanted some, he’d turn out the light before taking off his pajamas. He was self-conscious about being skinny, his ribs showing, so it was always pitch-dark when we did it. He said American food, all it did was give him gas. I had to learn to cook German, big heavy dinners, sauerbraten with red cabbage, bratwurst. For the first time in my life I had to watch my weight. Walter didn’t gain at all. He still passed gas, only now it was okay, it was German gas. He’d cut one, aiming his finger at me like it’s a gun? I’d have to pretend I was shot." Great interview. What he says about Bissell is also why Elmore is so great. Being funny without appearing to try to be. That's what separates Elmore from most of his peers. I can really hear Don DeLillo in some of Leonard's writing -- for example in the dialogue excerpted from Up in Honey's Room. Al Hooper: Elmore rules! He has a marvelous sensibility and uncanny insights into human behavior. Long may he persist!